Gfycat is a unique GIF hosting service that improves the GIF viewing experience by three means, i.e., speed, size and add-on features. The files created by Gfycat are 10x faster than normal GIF files and moreover they are smaller in size. This service is not only limited to GIF files, but it also supports various other formats. To use their service, you just need to upload the GIF file, and it will create a GFY link for that file. Surprisingly the link generated contain two links, one is the GFY file that is created by Gfycat, and another one is the original file. The intelligent system of Gfycat picks the best format that is supported by the user browser. Gfycat save lots of bandwidths and improves the GIF viewing experience of users. The delivery of GIF and GFY files via Gfycat is very fast as they have Global CDN along with multi layers of load balancing and caching. The web service was online from 2013, but this year they finally bought their Android application. The application is not available globally at the moment. Therefore you can download Gfycat APK for Android from the link provided below. You need Android 4.1 or above to use this application. Speed: Averaging 10x faster speeds than traditional GIF. Unlimited size: Support for large GIFs or videos. Nifty features: Analyse frame by frame by pausing, reversing, slowing down or speeding up. To use the application, you just need to open the application and use the ‘fab button’ at the bottom right to click picture from your camera and create GIF from it with an option to edit it with many cool features. You can even use your gallery videos, and with a single click, it will get uploaded to Gfycat hosting. You can even share the GIF file created with Gfycat to your Facebook and other messaging app friends. It’s never been so easy to use Gfycat and handle your GIF files till now. The application will soon be available worldwide. 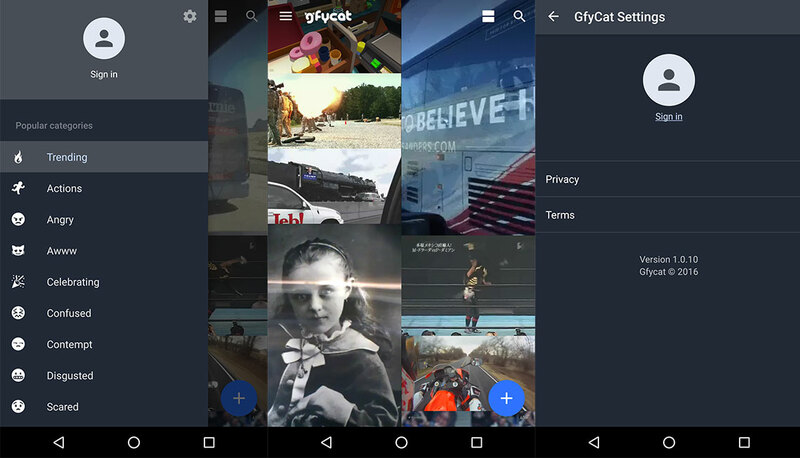 To download the latest version of Gfycat for Android, stay tuned with us, we always update the article with the latest version.